Cleveland Browns tight end Jordan Cameron catches a pass while being defended by Jacksonville Jaguars strong safety Johnathan Cyprien in the second quarter at FirstEnergy Stadium. BEREA, Ohio — The Browns travel to play the Jets this Sunday with the possibility of not having their leading receiver or pass defender. In summarizing the Browns injury situation Wednesday, coach Rob Chudzinski disclosed that tight end Jordan Cameron showed up Monday with concussion-like symptoms. Cameron was not listed on the injury report after the game. He is in the NFL protocol for concussions and it is unknown if he will be cleared in time to play Sunday. He did not practice Wednesday. Cornerback Joe Haden, who suffered a hip pointer against the Bears did not practice Wednesday. 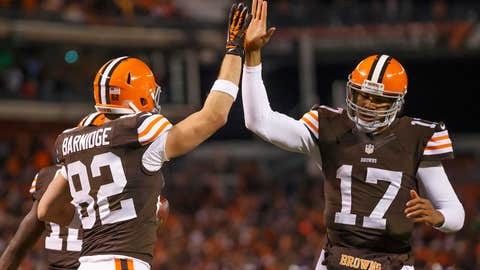 In recent weeks, three different Browns players have missed at least a game after a concussion, including Jason Campbell, Brandon Weeden and Willis McGahee. Cameron is the Browns leading receiver with 75 receptions for 848 yards and seven touchdowns. He has an outside chance to tie or break the Browns franchise record of 89 receptions in a season over the final two games if he plays. If Cameron can’t go, the Browns will lose one of their top two play makers. Receiver Josh Gordon knows if Cameron cannot play, it will put more of a burden on himself. Gordon has 74 receptions for 1,467 yards and nine touchdowns. If Cameron cannot play, he will likely be replaced by Gary Barnidge and MarQueis Gray. Barnidge has 11 receptions for 104 yards with two touchdowns, including a 40-yard score against the Patriots. Gray has caught two passes for eight yards. The other two tight ends, Andre Smith (calf) and Keavon Milton were inactive last week. Barnidge has the most experience, but Gray might have the most upside. Gray has mostly been used out of the ‘wildcat’ and last Sunday he had back-to-back runs of 18 and 12 yards to move the ball to the Bears’ two-yard line to set up a touchdown by Edwin Baker. Barnidge is ready if called upon. Barnidge said it’s ironic that he is viewed more as a blocking tight end, rather than a receiver. Barnidge was an unrestricted free agent signing during the offseason from Carolina. He has 29 receptions in his six-year career for 424 yards (14.6 avg.) with three touchdowns. 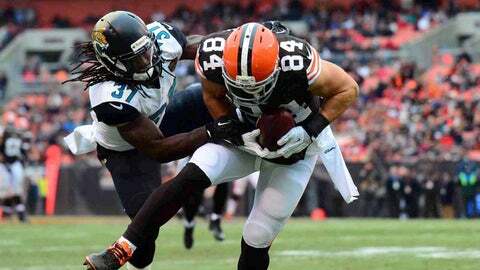 Barnidge has played in all 14 games, including 10 starts when the Browns opened in a two tight end set. Gray was a quarterback in college at Minnesota and was signed by the 49ers as an undrafted rookie free agent. He was converted to tight end and released at the end of training camp. The Browns claimed Gray and added him to the active roster. Gray (6-4, 250) has rushed five times for 39 yards, all out of the ‘wildcat’. When not playing tight end, Gray has lined up as a fullback. Gray admitted he’s been playing catch up since joining the Browns, but he’s not complaining. He admitted learning to block has been a big challenge, having never been asked to do so before. “As far as blocking, not many quarterbacks go from quarterback to tight end,” he said. “I need to show that I know what I’m doing. Gray feels he can make the transition fully and be a good NFL tight end. Gray hasn’t thrown the ball out of the ‘wildcat’ and admitted he has a good arm. He said he can throw the football 65 to 70 yards in the air. Besides his other duties, Gray is the Browns emergency quarterback. “Arm strength is one of my positives,” Gray said. –Gordon said one of his goals is to play well in the final two games. He currently has broken the franchise record for receiving yards and needs 15 receptions to tie the franchise mark of 89 receptions. — Chudzinski re-iterated his belief in the direction of the Browns on Wednesday. OL Joe Thomas, who has only been a part of one winning season since being with the Browns agrees. “I still think the future is bright,” Thomas said. “If we can add a couple of pieces and build on what we have (here already). — The Browns injury list is growing. Besides DB Joe Haden (hip), TE Jordan Cameron (concussion), OL Joe Thomas did not practice during the portion of practice open to the media. Others not practicing were OL John Greco (knee), TE Andre Smith (calf) and LB Eric Martin (undisclosed). RB Willis McGahee was cleared to practice and play after missing last week’s game with a concussion. — On Tuesday, the Browns released DB Chris Owens and WR/PR Armanti Edwards. Both players were on injured reserve. Owens was signed as an unrestricted free agent during the off-season and was the third cornerback. Owens had 54 tackles with 2.5 sacks, three passes broken up, a forced fumble and fumble recovery. Edwards was signed to handle punt return duties after WR/PR Travis Benjamin was placed on injured reserve. Edwards had four punt returns for 28 yards, including a long of 12 yards. It’s a big loss. He has been a big playmaker for us. Cleveland Browns tight end Gary Barnidge and quarterback Jason Campbell celebrate the touchdown in the third quarter against the Baltimore Ravens at FirstEnergy Stadium.